When my dad came over this last week with these wonderful home-ground green and purple peppers from his garden, I knew I was going to have to make some Vegetarian Chili with some of them. I love just about any type of chili, but it tastes especially good to me when I know that it is full of healthy and nutritious ingredients. I have been making different Vegetarian Chili recipes for several years now, but this one is definitely my favorite so far. 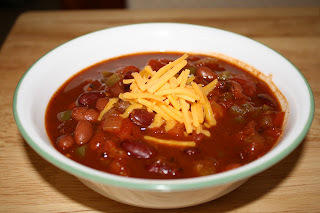 I love chili because it is fairly easy to make and you can eat the leftovers for several days. Usually it tastes better after the first day too. This chili is chock-full of fiber so it is very satisfying and it keeps you full for a long time after eating it. If you don't add any cheese or other extras at the end, it is also very low fat. I actually got the idea for this chili from one of my favorite cook-books . I have changed it some, however (four cans of beans in a batch of chili is just too much for me). 3 (14.5 oz.) cans of diced tomatoes- I also threw in 3 diced up tomatoes from my garden. 2 cans of beans, rinsed. I use 1 can of chili beans and 1 can of Kidney beans but you can use whatever kind you like. 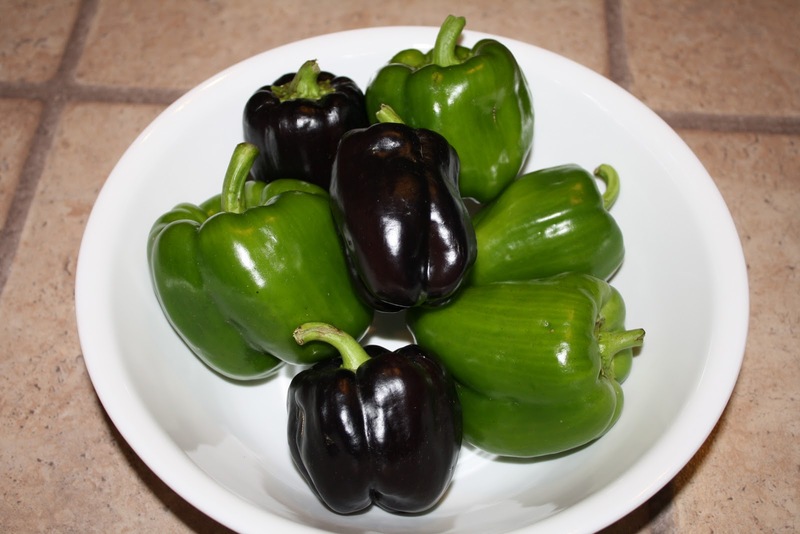 Heat the oil up in a medium to large sized pot and add the onion and bell pepper. Saute until the vegetables are tender. Add the Chili Powder and Cumin and stir to coat. Cook for about a minute-stirring if needed. Add the Garlic and cook for only about 30 seconds, then add the water, tomatoes with their juice, and chipotle peppers. Cover and cook, stirring occasionally for about 30 minutes. Add the beans and cook, stirring occasionally for another 30 minutes. Top with the optional ingredients if you like and enjoy. *If you do buy the Chipotle Peppers and Adobo sauce- Since I only use these to make this chili, I divide the remaining ones up into groups of 2 or 3 and put them in ziploc baggies and freeze them until I need them. They seem fine and they only take about 20 minutes to thaw out. Anna I am so excited that you brought your wonderful Vegetarian Chili over to The Cottage for The Texas Star Chili Cook-Off. It looks really good, we are going to have so much fun. $10 Off A $20 Apparel Purchase At Sears! *Hot* Deal: Free Yoplait At County Market! County Market Match-ups Updated+ Yoplait Deal? Update: I Finished My Tackle It Tuesday Project! Six Free Children's Books From Pacific Learning! Hurry! Hot Deal on Women's The North Face Items!